What Makes a Good Stollen ‘Great’? The best tasting Stollen contains select quality wheat flour, yeast, butter (instead of margarine or vegetable oils), dried raisins, sultanas or currants soaked in rum, orangeat(candied orange), Zitronat (candied lemon), and powdered sugar as topping. Occasionally, marzipan, vanilla extract, almonds nut and spices are used to enhance flavors. The standards of the German bakers association prescribe that for every 100g of flour, Stollen must contain at least 30g of butter and at least 60kg of dried fruits. Top quality Stollen are incredibly delicious, and – if consumed in moderation – will not add to your waistline. They have just the right amount of moisture, yeasty texture, balanced taste, yet distinct individual flavors of each component and are not too sweet. The right amount of butter is key. Light Weight Stollen doughs contain up to 10% fats, Medium Weight Stollen contain up to 30% fats, and Heavy Weight Stollen contains up to 50% fats. Due to its high content of fats and fruits, Stollen keeps fresh and can be stored for a long time before getting rancid or stale. Although not light in calories, high quality Stollen burns fast and does not make you feel heavy. Connoisseurs can taste the difference. Stollen can be made with any of the three dried fruits; they just have to be from top quality suppliers. 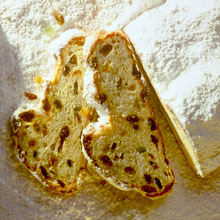 Many great stollen varieties use sultanas because of the lighter color. What is the difference? Raisins are dried white grapes, made from distinct varieties, such as Thompson Seedless or Muscatel and are produced mainly in the USA, Turkey, Greece and Australia. Sultanas are smaller, sweeter and lighter than raisins, with a distinctive golden-pale color. They originated in Manisa, Turkey, and most sultanas still come from that country. Currants are dried, black, seedless grapes originally produced in Greece. They are also known as ‘raisins of the sun’. For 1.5 kg of flour, use 300gr sugar, 625 g butter, 125g lard, 750g Raisins, sultana or currants (softened in rum), 375 g of candied lemon zest, 375 gr slices almond, 110 g yeast, 1 dash of salt, grated lemon peel, and 250 g milk. Store in a cool place after baking, before it is ready to eat. Voila! These are (part of) the secrets of how to make a great tasting Stollen. According to EU law, the name Dresdner Stollen is protected; that is, products sold under this name had to be made in or around the city of Dresden. The protection of geographic origin preserves distinct identities, qualities and recipes for well-known regional European specialties. Dresdner Stollen is one of these select few foods. The Dresden bakers have to join the Association for the Protection of Dresdner Stollen and abide by prescribed manufacturing rules: they have to make the Stollen by hand, can use only butter, – at least a 50% ratio to the amount of flour used – and can use only rum-soaked sultanas – at least a 65% ratio to the total weight of flour. All Dresdner Stollen have to pass inspections by fellow bakers before receiving a quality seal and the EU seal for protected geographic origin.